Reposted with permission from World Wide Pop. 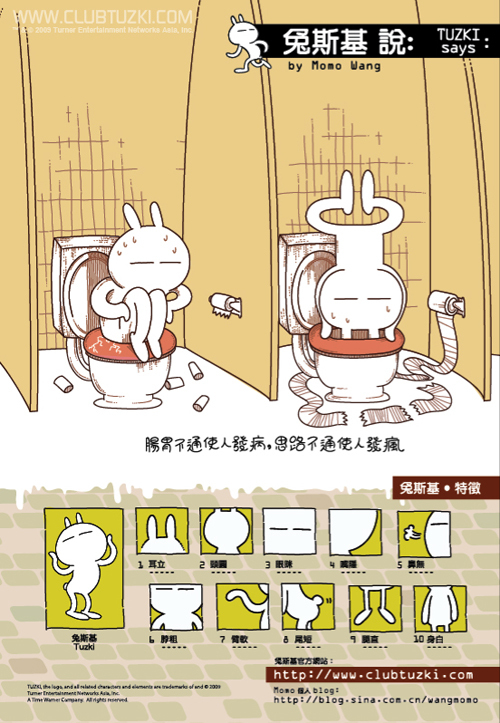 The story goes that Wang Momo (王卯卯), an undergraduate at the Communication University of China, was doodling on her blog one day and came up with a peculiar yet distinct rabbit-like creature. Built with Snoopy proportions, it also had no mouth and only had slits for eyes. Its name was Tuzki (兔斯基). Three months later, Wang made an animated emoticon of it. (Emoticons are icon-sized images used to express emotion or to “make a face” in text-only online conversations. 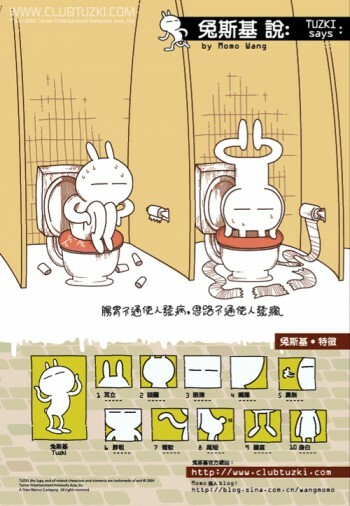 They are especially popular in China.) Over the course of the following year, Wang continued to animate Tuzki performing various actions, adding to the arsenal of the Tuzki set. The emoticons took off. It appeared all over people’s online conversations on QQ and MSN Messenger, in various forum posts, and brought 30 million visitors to Wang’s blog. Wang, on her part, continued adding to the emoticon set and experimented with placing Tuzki in new and intricate illustrations. 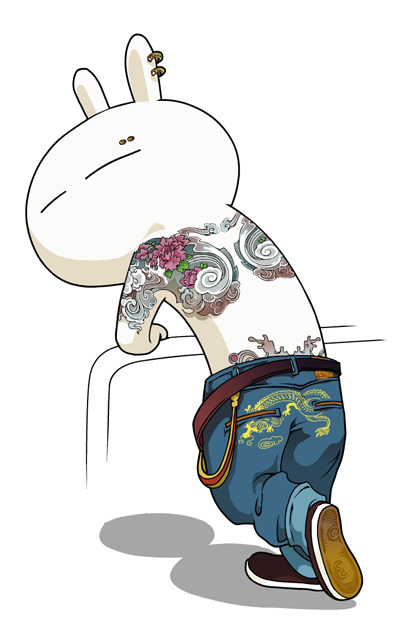 By the end of 2007, Tuzki became so popular that the commercial world noticed him. 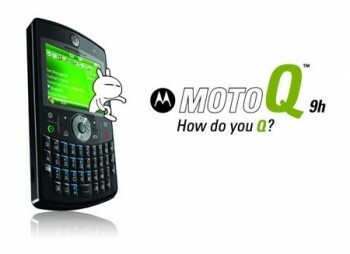 Motorola hired Wang and Tuzki for their campaign promoting their new Q9h phone. By summer of 2008, Wang finally graduated from the Communication University of China. She promptly landed herself a gig at the Time Warner office in Hong Kong, with Tuzki in tow. (Time Warner owns Cartoon Network and DC Comics, amongst other things.) There, she published a Tuzki book, wrote various comics involving the rabbit and continued to place him in different product endorsements. The book, I, Tuzki, U? (我兔斯基你) sold 160,000 copies. After spending a year at Time Warner, Wang quit, citing a desire for more personal and creative freedom. Yet Time Warner cleverly held onto Tuzki. Both parties have moved on after they split up. Time Warner have continued developing the Tuzki brand in their recent Tuzki Snap iPhone app and Tuzki Milk Mogul Facebook game. Wang, on the other hand, has since published a second book using a different character, and no longer posts about Tuzki on her personal blog (though the rabbit still makes an appearance in the sidebar). On the surface, the story of Tuzki may seem like a happy one: Time Warner has landed itself with one of China’s hottest licensed characters and Wang has become a celebrity illustrator with a solid fan following. 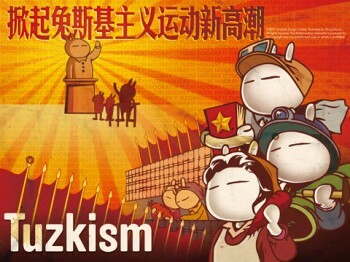 Yet, in reality, the story of Tuzki is a case study of failure in the cartoon industry in China. Nothing Wang or Time Warner has made rivals the sheer impact and unique personality of the early Tuzki emoticons. The animated commercial ads are cute, comics strips enjoyable and mobile apps popular, but none possess the same draw or distinct mark of the original. 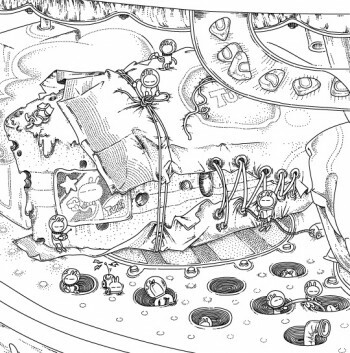 And what’s worse, none have added more depth to the Tuzki character. At this rate, the charismatic, mouth-less rabbit may never transcend its status as an massively-popular internet fad of 2007. Tuzki may forever remain as mysterious as when he first appeared, an expressive rabbit-like creature without a mouth but with some really great moves.